Sharks point guard BJ Holmes. Pic: Dean Woolley. Sheffield Sharks are a win away from the BBL Play-off final after a one point loss against Newcastle Eagles last night at the EIS. The 91-90 victory for Newcastle means that if Sharks can beat the Eagles in the north-east tomorrow they’re almost certain to make the BBL’s showpiece event at the O2 Arena in London next Sunday. Having lost all three league games against the triple winning Eagles it would have been nice for the Sharks to finally taste some success against the league’s best team. However, Sharks only fell to a score 1.8 seconds from time by Eagles point guard Rahmon Fletcher and could have snatched the win but Nick Lewis’ shot on the buzzer hit the front of the rim. Sharks dominated the first quarter to lead 22-17 before Newcastle took the lead in the second quarter. But neither side could build a big advantage and Mike Cook’s two gave Sharks a 46-45 advantage. Eagles forged a 71-61 lead late in the third quarter before Sharks battled back to 73-69 heading into the final period. Another Newcastle double-digit lead (89-79) was established before an 11-0 burst by Sheffield looked to have sealed the win before Fletcher’s last ditch score. 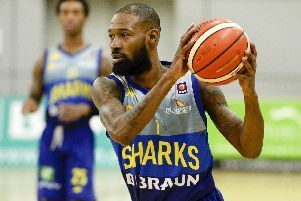 Sharks guard Cook joint top-scored for Sheffield with 18 points but struggled with foul trouble. He said it’s important he’s able to play a significant role tomorrow: “They hit some big shots, they hit some big threes. They spread us out a little bit and got to the middle of the lane. “A few calls didn’t go our way but with all that we’re only down one point so we have a great opportunity to go up there and close them out. Cook is confident that Sharks have what it takes to win in Newcastle. He said: “I think they know (how good the Sharks are). They will have watched film on us and we’ve played a lot better. We beat Leicester (in the play-offs first round). “They’re (Newcastle) a team that have been doing the same thing for years so they’ll keep doing their things. “They have guys who hit big shots but so do we. I think it’ll be a great series but we have their attention. “I have to find a way to stay in the game and not foul but be aggressive. I got away from the ball screens and I don’t know why I did it, which helped them back into the game.